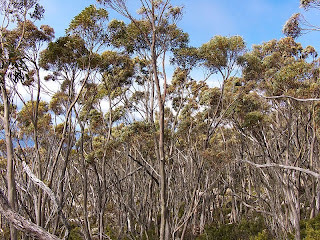 The upper part of the Icehouse Track on Mt Wellington is dominated by the Tasmanian Snow Gums, (Eucalyptus coccifera). There are the burnt remains of solid, thick-trunked trees, some of which have sprouted thinner new branches. In the main they are small and slender trees, and I'm assuming the older trees were destroyed or badly damaged in the 1967 fires, and what we see there now is the extent of the regrowth over the last 41 years. 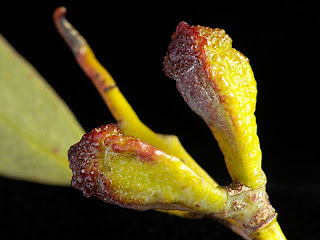 E. coccifera grows to 35m in ideal sheltered sites, but may only be a shrub or stunted tree of 6-9m on the "highest and bleakest sites" (Forest Trees of Tasmania; Forest Resources [Boral Timber] 1995). The trees at the top of the Icehouse Track are obviously the latter. 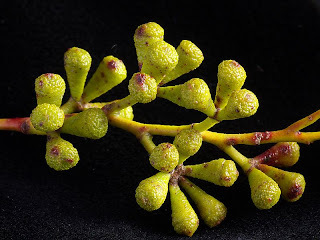 The leaves are 5-10cm x 1-2cm. The tips are crimson, and hooked. 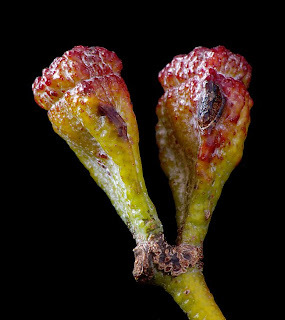 The buds are in groups of up to 7 in most sites, but in groups of up to only 3 on Mt Wellington, and up to 1cm x 0.4cm. The capsules are cup-shaped with a wide flat disc, up to around 1 x 1.2 cm. These are younger capsules, showing a deep red disc and green cup. 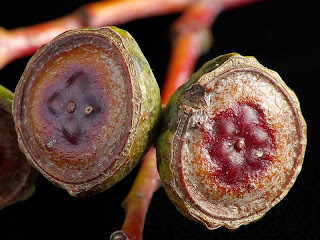 Now, the Snow Gums on Mt Wellington appear to be distinct from those found elsewhere in Tasmania in terms of the maximum number of buds found in a group. On Mt Wellington, there are up to three, and this can be seen in looking at the specimens there. Elsewhere there can be up to seven. At Hartz Mountains, this is the case. 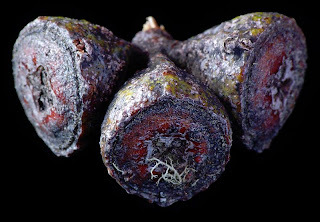 These buds and capsules are from trees on the plateau. 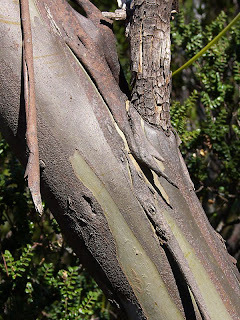 Bark of Snow Gum, Hartz Plateau. 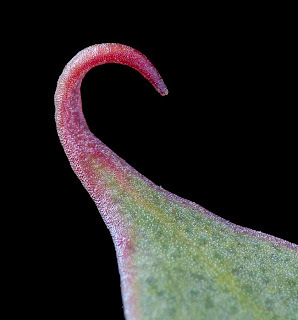 The curled leaf tip must have been designed by Leunig. It is interesting to be able to date the regrowth to the 1967 fires. I remember, as a kid in Melbourne, seeing skeletal Mountain Ash trunks still towering over the regrowth forest. This was pre-1959 (when my family left Melbourne), but he fires were from 1939 - the worst fires in Victoria in living memory. Nice post, even with a bleak sub-theme. I certainly recall hearing about those fires. It does serve to show how most Eucalypts recover after fire. 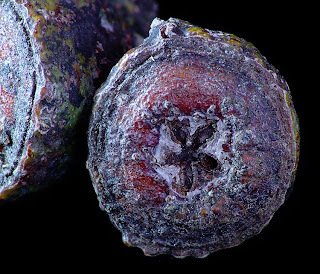 Mountain Ash are different, I understand. 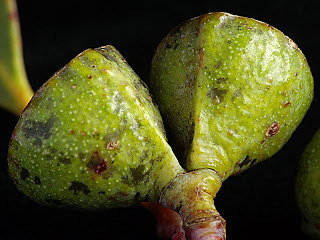 They shoot from seed, apparently, not epicormic growth. Not sure about which form of regrowth your trees have used. Possibly the 67 fires were so hot that they killed the trees outright. I am surmising about the date of the fires, but I'm sure this community was burnt in 1967. I think they are a mixture of new trees from seed and epicormic growth from (barely) surviving trees. the results of the 1967 fires are still evident all over Mt Wellington. Hey thanks Mosura, and, yes I know - I will be going back to get some flower photos. There are also the juvenile leaves, which I saw but didn't photograph. I'll get them next time too. And, there's the bark, on both young and older trees. The bark on these trees can be really spectacular. 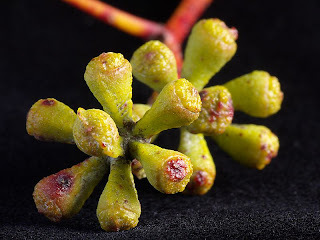 Overall, they are very beautiful and interesting plants, with many features. 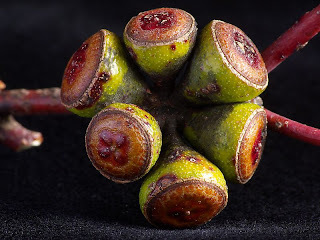 I think it would be interesting to build a definitive online database of native plants, including photos of their features. From my amateur point of view, this would really help me be sure of some of my identifications. 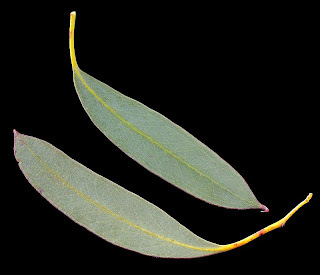 Also, having read a bit more about the eucalypts, many of them appear to blend into the various neighbouring species and produce transitional forms to further confuse the identification.